Columbus was one of several Central Ohio districts that responded to threats made against schools. Other districts canceled classes or placed schools on lockdown on Friday. Seventeen schools closed in total. District and police officials in Columbus would not specify which schools have more police presence, but officials said their main focus is high schools. "We've also pulled together detectives from three different investigative units that are currently working and following up on these specific threats," Columbus Police Deputy Chief Michael Woods said. "And as it's been stated, the person or student who made these threats will be held accountable." Woods said he cannot provide more details on the number or nature of threats the school district received. However, he said detectives have honed in on one threat in particular to investigate. "There is one that has been appearing on social media. And that's the one that we are trying to so to speak run to ground," Woods said. "We want to get that back to who made that original post and have a discussion with that person. That's the one we have the most information on and are following up on." Woods said the individual behind the threat could receive charges up to the felony level. The threats come one week after 17 people died in a mass shooting at Marjory Stoneman Douglas High School in Parkland, Florida. Lancaster High School is closed today after a student received a threatening phone call from an unknown caller Thursday night, according to its website. All the schools in the Logan-Hocking School District closed after a threat was made to "LHS." This follows a Wednesday lockdown for an "emergency situation." The district has seven schools. Lakewood Local School District also closed all its schools today. According to a Facebook post, the district says it "received information that students were arrested overnight. We do not have more information at this time. We decided to clsoe as a precaution as safety is our highest priority." Westerville South High School was placed on lockdown until around 10:45 a.m. Friday after reports that someone with a gun was in the area, according to Westerville Police's Twitter account. Some Fairfield Union Local Schools were closed or on lockdown after "a person of interest who has a history of being armed and dangerous was in the Pleasantville area this morning," according to its website. No direct threats have been made against the school district. 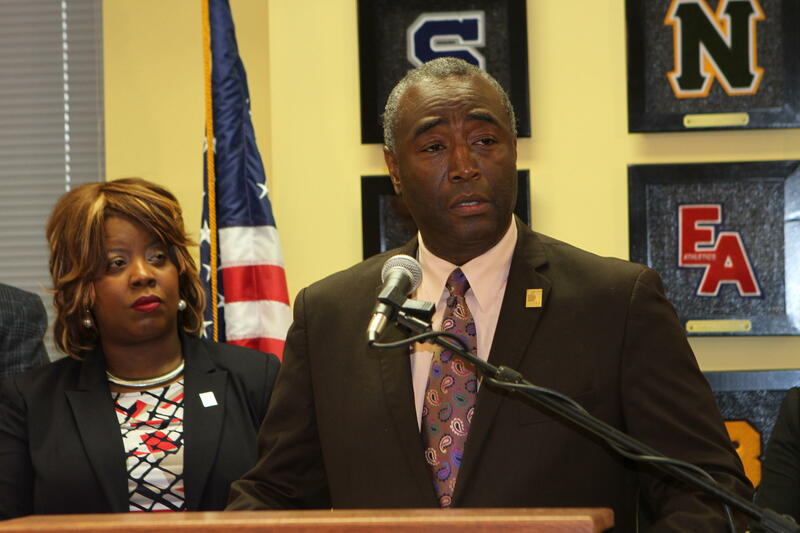 Columbus City Schools interim superintendent John Stanford asked principals throughout the district to hold town halls next week to discuss the issue. He also asked parents to discuss the issue with their children. "Tonight and over the weekend, we are pleading with our families to have thoughtful conversations with their young ones about carrying weapons in school, out of school or even out in the neighborhood," Stanford said. The district does not support arming teachers as a measure to protect students against outside threats. "No, it is not a good idea for Columbus City Schools," Stanford said. "As you see this morning, we have a wonderful relationship with the Columbus Division of Police who are trained professionals who have worked with us for years to provide school resource officers in our buildings."